David C. Williams has a world of experience. A graduate of West Point, he served in Iraq, Bosnia and Germany as well as a non-military stint as an intern for a judge in the Republic of Botswana. Williams was awarded the Army Commendation for Meritorious Service for duty during Operation Iraqi Freedom II, a theater of war in which he supervised the operational and combat readiness of 23 soldiers and led a convoy that placed radar teams in northeastern Iraq. Before that, he participated in missions in Bosnia. Since joining Kline & Specter, Williams has worked on a number of important personal injury, medical malpractice and whistleblower cases. He was made a partner in 2017. In December 2018, Williams represented a whistleblower in which a hospice company paid nearly $5.9 million for wrongly billing Medicare for unnecessary care. According to federal authorities, SourthernCare Inc. placed patients who were not terminally ill into hospice and submitted claims for that more expensive treatment. Most recently, in a settlement announced in January 2019, Williams represented a pharmacist who blew the whistle on Walgreen Co. (“Walgreens”) for allegedly submitting claims to Medicaid for stimulants such as Adderall, Ritalin, and Vyvanse without first verifying with the prescribing physician that the physician had prescribed the medicine for medically appropriate treatment, as is required. Walgreen agreed to settle the Wisconsin case for $3.5 million. In a personal injury matter, Williams was co-counsel in a case that resulted in a $10 million settlement in 2014 for the family of a 21-year-old mechanic who was crushed to death beneath a truck at a Philadelphia-area refinery. The lawsuit alleged that the refinery failed to implement vehicle maintenance procedures in compliance with government standards. Also in 2014, Williams was co-counsel in a personal injury case that resulted in a $5.5 million jury verdict for a mentally disabled man who was rendered a quadriplegic after the commercial van in which he was riding struck a utility pole. Williams has been chosen each year from 2013-2018 as a Pennsylvania Super Lawyer — Rising Star, which places him in the top 2.5 percent of attorneys in the state who are 40 or younger. He also was honored in 2013 with a Diverse Attorney of the Year award given by The Legal Intelligencer to outstanding minority attorneys from across Pennsylvania. 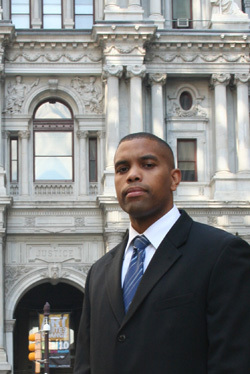 Williams is active in the Barristers’ Association of Philadelphia and was elected to become its next president in September 2019. The organization, formed in 1950, addresses the professional needs and development of black lawyers through seminars, cultural events and publications and it takes a pro-active role in fighting injustices in society. While in the armed forces, Williams also worked as a diversity admissions officer, a post in which he managed recruitment and mentorship of minority West Point candidates across 110 congressional districts spanning 11 states in the western United States. While in law school, Williams did internships with the Civil Division of the U.S. Department of Justice, Federal Programs Branch, where he drafted memoranda on various issues, and also for Steptoe & Johnson, an international law firm based in Washington, D.C.
For another internship he prepared case summaries for Justice Maruping Dibotelo of Botswana and advised the justice regarding the application of principles of U.S. law to Botswanan legal jurisprudence. Williams earned his undergraduate degree in international relations from the United States Military Academy at West Point, where he won the Colonel George K. Osborn III Award for Excellence in Political Science. He played intramural football at West Point and participated in the Sandhurst Military Competition.